Getting to Saint John's most popular attraction on foot. Above: Loyalist Plaza Market, an open air market on Water Street near where it intersects with King Street. Below: On the other side of the street is The Barbour General Store. Above: Sidewalk cafes spill out onto the pedestrian mall that becomes the boardwalk at Market Square. 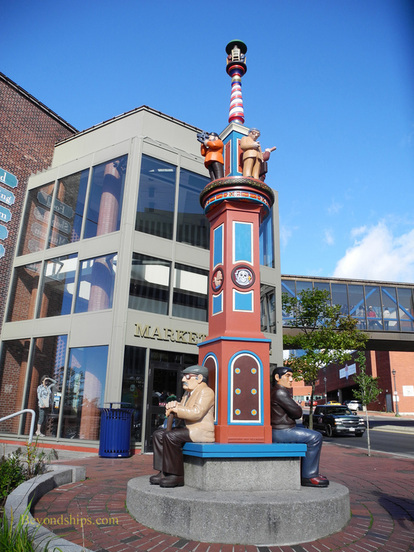 Below: One of the features of Market Square is the clock tower. Above: The beach volleyball court at Market Square. 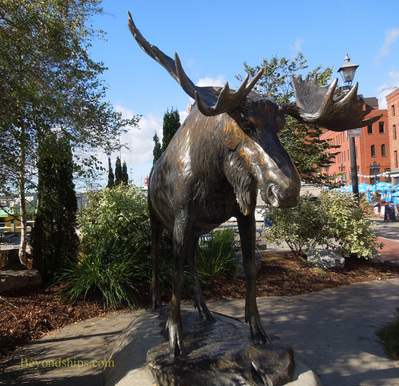 Below: The popular moose statue. When I first cruised to Saint John, the only practical means of seeing the Reversing Falls was to take a tour or to hire a taxi. 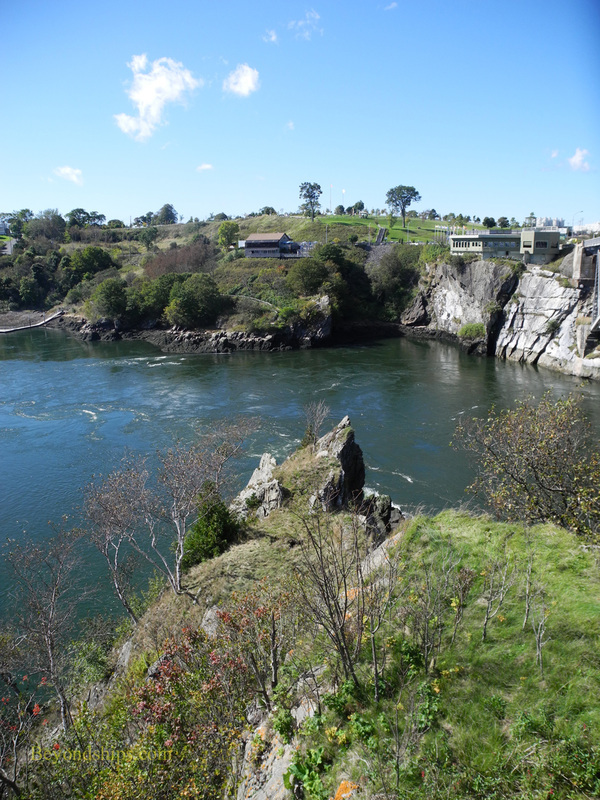 The Reversing Falls is not far out of town but there was no good way to get there except by motor vehicle or by boat. However, Saint John has built a waterfront promenade called the “Harbour Passage Trail.” Although it does not go all the way to the Falls, I had heard that it connects to a street with a good sidewalk that takes you to the Reversing Falls. So I decided to try it out during a recent port call in Saint John. First, I should explain what the Reversing Falls is. Saint John is located on the Bay of Funday at the mouth of the Saint John River. The Bay of Funday is subject to significant tidal changes during which the level of the water in Saint John harbor can rise 28 feet in just a few hours. At high tide, water comes into the harbor and into the Saint John River with such force that it counteracts the current of the river and the flow of the river is reversed. Not far out of town, the river flows through a narrow gorge and the effects of this phenomenon can be seen most dramatically there. Thus, do not go to the Reversing Falls expecting to see water flowing up some Niagara-like vertical drop. Instead, expect to see turbulent water, whirlpools and rapids in confusion. However, this is only if you arrive at high tide. The rest of the time, the Reversing Falls are essentially a pretty looking gorge with some rapids. My trek to the Reversing Falls began at Saint John's original cruise terminal (the Marco Polo Terminal) on Water Street. 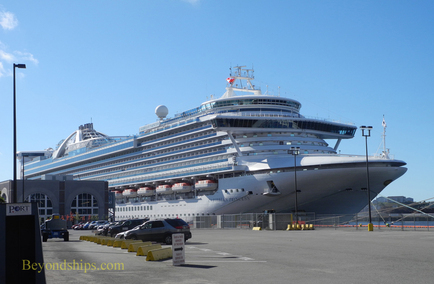 Saint John has three places where cruise ships berth. Two of these are along Water Street (the original terminal and one that opened in 2012 - - the Diamond Jubilee Terminal) while the third berth is actually closer to the Harbour Passage at the Long Wharf. Coming out of the terminals on Water Street, you turn left and proceed up the gentle slope of the street. Most of the independent travelers from your ship (i.e., those not on a shore excursion) will be proceeding in this direction. Not very far along, King Street intersects with Water Street. 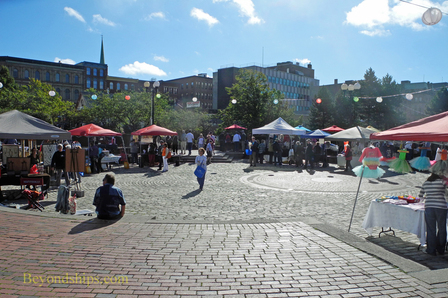 This intersection is the de facto heart of Saint John from a visitor's perspective. On the right hand side of the street is the historic Barbours General Store, now a museum. On the left hand side is an open-air market with vendors selling unique arts and crafts and the Market Square/Market Slip complex. There are usually lots of people milling about. This is where Saint John began as, according to tradition, it is where the first settlers landed in 1783. Subsequently, it became part of the city's waterfront and was mostly warehouses. However, it has been extensively re-devloped in recent years. 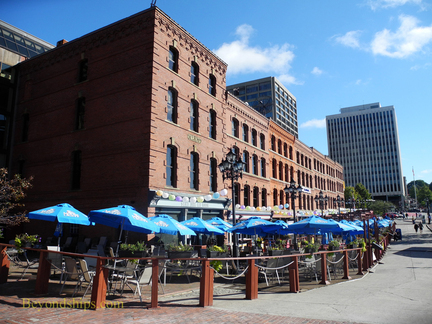 The red brick warehouses have been converted into stores and cafes, many of which have outdoor seating on the pedestrian mall that wraps around this portion of the harbor. Among other things, there is also a beach volley court and a life-size statue of a moose. (Moosehead beer is brewed in Saint John). One feature that catches the eye is the clock tower. It has no traditional clock face. Rather, you can tell the time by the position of the serpent's tail. Most people, however, do not use it as a timepiece preferring just to have their photo taken with one of John Hooper's cartoon-like carved figures that sit on the bench portion of the tower. Turn left down the pedestrian mall. There are some nice views here including a small lighthouse. 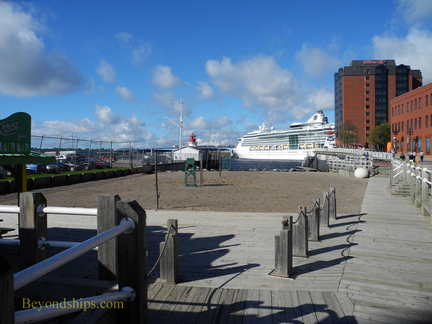 It is a good place for taking photos of the cruise ships berthed along Water Street. Sometimes you can see a harbor seal swimming by. Continuing along, the mall becomes a boardwalk near some contemporary buildings. They are done in red brick so as to harmonize with the old warehouses. One is a hotel. Another contains the New Brunswick Museum and a modern shopping mall.